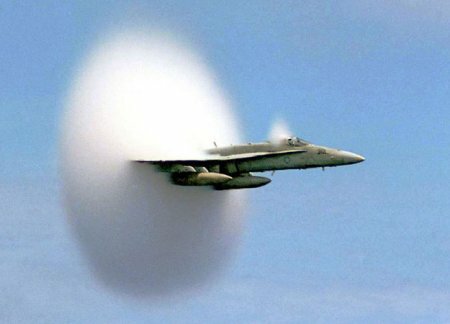 An F/A-18 Hornet photographed just as it broke the sound barrier. Credit: Ensign John Gay, USS Constellation, US Navy. A sonic boom is the loud noise created by the shock wave set up by an aircraft or missile traveling at supersonic speeds. A subsonic aircraft produces pressure waves ahead of itself, which travel at the speed of sound, and clear a path for the oncoming aircraft. In supersonic flight the aircraft overtakes the pressure waves so that a shock wave cone is created with the nose of the aircraft at its vertex. In level flight the intersection of the shock wave cone with the ground produces a hyperbola, at all points along which the sonic boom is simultaneously experienced; subsequently the boom will be experienced at all points within the hyperbola's path over the ground. Large meteors and the Space Shuttle often produce audible sonic booms before they are decelerated below the speed of sound by the Earth's atmosphere. In recent tests, the maximum boom measured during more realistic flight conditions was 21 pounds per square foot. There is a probability that some damage – shattered glass, for example, will result from a sonic boom. Buildings in good repair should suffer no damage by pressures of less than 16 pounds per square foot. And, typically, community exposure to sonic boom is below two pounds per square foot. Ground motion resulting from sonic boom is rare and is well below structural damage thresholds accepted by the U.S. Bureau of Mines and other agencies. The energy range of sonic boom is concentrated in the 0.1–100 hertz frequency range that is considerably below that of subsonic aircraft, gunfire and most industrial noise. Duration of sonic boom is brief; less than a second – 100 milliseconds (0.100 s) for most fighter-sized aircraft and 500 milliseconds for the space shuttle or Concorde jetliner. As a plane accelerates to just break the sound barrier, an unusual, halo-shaped cloud sometimes forms if the weather conditions are just right. The origin of this cloud is still debated. A leading theory is that a drop in air pressure at the plane described by the so-called Prandtl-Glauert singularity occurs so that moist air condenses there to form water droplets. These halos of vapor appear for only a few seconds when aircraft reach speeds just below or just above the speed of sound.